Turn your entryway into a memorable sight with the KelKay Vision Contemporary Fountain with LEDs. The sound of moving water lends drama to any setting, and this unit enhances it with bold shape and bright LEDs. The sleek, rounded frame evokes a crescent, with strategic cuts and angles for an abstract feel. Mottled gray and black hues help this item mesh with any surrounding, and the reflective finish adds wonderful shine. An opening at the base of this piece houses a disc of LEDs, with a fountain head in the center for added fun. Place the included rocks around this ring, adding personal style and a natural hint to your home. Fill the base of this sculpture with up to 1 gallon of water, and place the included, magnetic drive pump in this hidden reservoir. This 65 gph, adjustable pump not only powers the small fountain; it also runs the ring of white LEDs, which perfectly illuminate the water. Ensure the water flow is just right using the regulator on the front of the pump, increasing or decreasing it as desired. 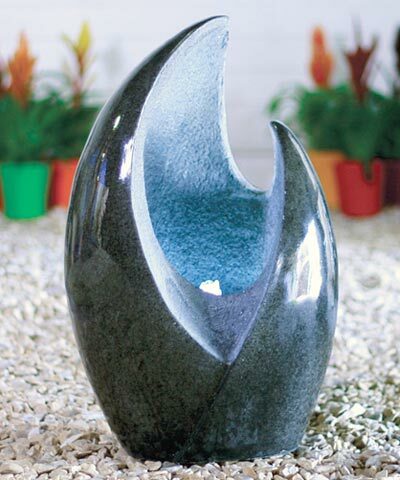 The level base allows this fountain to rest on a table, deck, or patio easily, and its all resin body remains durable. The item can be displayed outdoors during the warm months, and in your home in winter to protect it from freezing. Place an eye-catching adornment in your office or home with this Vision Contemporary Fountain with LEDs. Some assembly required. One year limited warranty.